A petition advocating for legitimization of students’ preferred names has been circulating the USD campus for the last month in an effort to change the university’s name policy. This petition will allow students to change their legal names to their preferred name on their myUSD portals including on their emails and Desire2Learn accounts, their identification cards and other important documents. 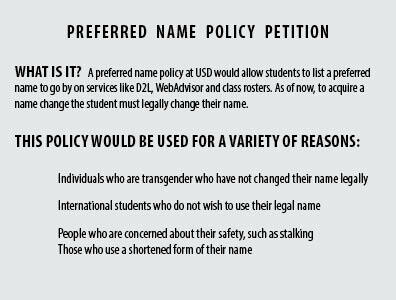 Currently, USD policy mandates that students and faculty must have a legal name change in order to change their name in the school systems. Olivia Mann, senior criminal justice and sociology double major, worked on starting the petition with Jae Puckett, assistant psychology professor, and other concerned students and faculty. In an email interview with The Volante Mann said the preferred name petition was formed because university administrators said they would not be able to implement a preferred name policy until the new computer systems were brought in, which is not expected to happen until the fall of 2019. Mann said that although some policy elements cannot be used until the computer systems can support them, she would like to see USD clarify its stance on the preferred name. Petition organizers are not required to collect a minimum number of signatures. Mann said the purpose of the petition is to show the USD administration that this is an issue students care about. “We are simply aiming to demonstrate to the USD administration that this is an issue that students, faculty, and community members would like to see addressed and resolved,” she said. Mann said in an email interview with The Volante that she believes this petition will benefit more than just the LGBT+ community on campus. The petitioning is now over and Puckett is working on counting all the names acquired. The current count is over 300 signatures. Puckett said the next steps are to write a letter to university administrators, bring the issue to the attention of Student Government Association and deliver the petitions to both SGA and university administrators. Puckett said acquiring a legal name change is a hard process and should not be a requirement to use a preferred name. Puckett said students and faculty should not have to go through the entire process of a legal name change in order to use their preferred name. Megan Street, a senior anthropology major, who helped collect signatures said that even though the preferred name policy may not seem like a big deal, it would have a great impact on students’ experience at USD. Mann also said students’ USD experiences will improve if the preferred name policy is in place. Puckett noted a recent article from the Journal of Adolescent Health titled “Chosen Name Use Is Linked to Reduced Depressive Symptoms, Suicidal Ideation, and Suicidal Behavior Among Transgender Youth.” Puckett said the article is important in stating the tie between using students’ preferred names and lowered cases of depression and suicidal thought in transgender and gender-nonconforming youth.